The excellent solar energy availability in Portugal (between 1740 kWh/(m2.year) in the South and 1430 kWh/(m2.year) in the North for solar radiation in the horizontal), gives to Portugal the opportunity to decrease its traditional dependency on energy imports. The imports are coming down in the last years mainly due to wind energy contribution, but also due to a combined contribution of energy efficiency measures and renewable energy sources such as solar, biomass and large hydro. Since 2010 the dependency of the country in conventional energy imports is below 80%. It was around 75% in 2016 according to Observatório da Energia (ADENE) based on information from General Direction of Energy (www.observatoriodaenergia.pt/pt/energia-em-numeros/portugal/2000/2016/bar/%25/2276-2277-2278, viewed on 17-04-2018). The use of solar energy in Portugal in thermal applications is strongly connected to building applications, residential and services, through the usage of flat plate collectors. The values collected by APISOLAR (Portuguese Solar Industry Association) show that, at the end of 2015, the total installed capacity is above, but still around 1million m2 (1.121.104 m2 (784.773 kWth)) of solar collectors. Looking to the annual evolution along the last decade, is clear the importance of the national energy policy with financial and fiscal incentive programs. The impact of those subsidies on the 2009/2010 sales is clear (coincident with the peak of those incentives and easy access to bank credit) as well as the last five years decrease, without those incentives and a recessive environment of Portuguese economy. For 2016, it was not yet possible to confirm the estimate indicated in 2015 statistics produced by Apisolar. This puts the Portuguese market on a modest place within European countries (<200 000 m2 annual), although with average installed capacity per 1000 inhabitants of 66.1Wth when European average is of 68.7 (values for 2016 according to “Solar Thermal Markets in Europe - Trends and Market Statistics 2016, ESTIF, November 2017). In the National Action Plan for Renewable Energies (PNAER) is foreseen the installation of solar thermal collectors at 11.5% annual average rate until the year 2020, in order to achieve a total capacity of 2.2 million m2 on that date. However, contrary to the objectives of the Plan it was registered an annual average decrease of 30% between 2010 and 2012, and a decrease of 37% in 2013. From 2013 to 2014 and from 2014 to 2015 the decrease was of circa 9% each year. There is no information available for 2016 and 2017. We can expect an increase since the construction market is now growing either with construction of new buildings and also with retrofitting of old buildings, associated to the fact the building regulations continue to impose the installation of solar thermal collectors for water heating. But, considering the decrease observed between 2010 and 2015, there is still a need of an extra effort until the year 2020 to meet the objectives of PNAER. There is also work going on, to establish a new National Plan for the period 2021-2030 (Integrated National Plan for Energy and Climate) which is expected to have a first proposal until the end of 2018. In this plan, new and increased objectives for Renewable Energies and for Heating and Cooling are expected. The solar thermal collector capacity installed in Portugal is in majority directed to DHW applications, and is mainly directed (80%) to the residential buildings - divided in 60% for the single-family houses and 20% for the multifamily houses - while buildings in the service sector - tourism, public buildings, sport - absorb the remaining 20%. With a market directed to the single-family houses, it is usual to see the typical thermosiphon system constituted by 4 m2 of solar collectors and 150/200 liters horizontal storage tank on the roofs, covering, in average, 80% of DHW housing needs. For the collective systems, the average size is 40 m2. We can also point an evolution on the distribution in total, between Thermosiphon and Pumped Solar Heating Systems: from 60-40% in the past, to the actual 50-50% with a possible tendency to invert. In 2015, according to APISOLAR, the Thermosiphon systems manufactured or imported were circa 22% of the total of solar products. No information is yet available for 2016 and 2017. During previous decade, Portugal had a favorable RE policy environment, which contributed to expansion of solar thermal market in Portugal. The drivers were: a) the new regulation on Energy Performance of Buildings, which imposes solar thermal for DHW since 2006 in all new buildings and in building retrofitting with a cost of 25% of the building declared value; b) a strong incentive program in 2009/2010 connected with interesting fiscal measures. These measures decreased substantially the final costs of installed systems for end-users. Now, without those incentives, the final price is still high for the Portuguese level of life, but worries about energy security, after 2008, and the constant increase on conventional fuels can also be pointed as drivers of the Portuguese market. Although much higher numbers have been reported previously due to the peak of Solar Thermal Industry in 2009-2010, it is estimated now the following numbers: 10 producers, 20 distributors and 50 installers. These installers are typically the interface with end-user, marketing almost all the installed systems. 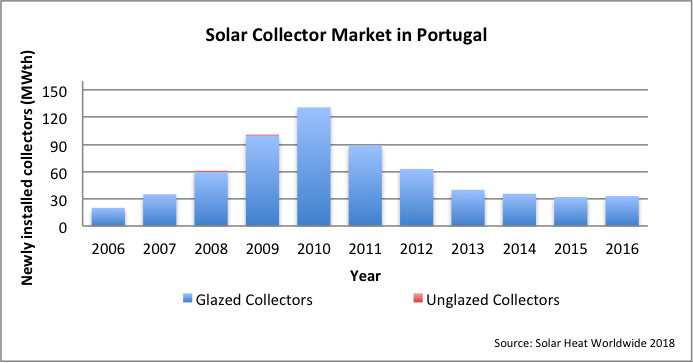 The major part of commercialized systems (produced and imported) are directed to the Portuguese market and based on flat plate collectors (98,2% - values for 2014 according to "Solar Thermal Markets in Europe - Trends and Market Statistics 2014", ESTIF, June 2015) and mostly with selective absorbers. In the 2013 report of APISOLAR it was estimated 270 workers working directly on the sector, which develops commercial relations with 630 workers. No other source of information is available. VAT is presently 23%, including RE technologies, but companies can amortize investment in 4 years, reducing by that way the annual taxation. No specific legislation on legionella, but there is an implicit recommendation on RCCTE (building thermal regulation) to heat water at 60ºC. Incorporation of solar technologies for buildings, like passive house and daylighting technologies, are taken into account in the building energy performance code which has a structure of classification (labelling) favourable to the introduction of those technologies, meaning that, when they are used in connection with solar thermal, it is easy to achieve the highest label. This highest label can then take profit of some fiscal measures. By this way the market players have also a good incentive to improve construction, and this also helps to prepare the market to near future imposition on net zero energy buildings. The regulation on Energy Performance of Buildings is in place and was revised in 2013 to improve construction conditions, according to the targets of Portugal in view of the 20-20-20 horizon. As other European countries, Portugal has a National Action Plan on Energy Efficiency (PNAEE) in addition to the PNAER (National Action Plan on Renewable Energies), incorporating several measures to increase efficiency in buildings. Those measures include the existing construction, being by that way an incentive to ameliorate the thermal conditions and comfort of the old buildings, which also need to be certified if there is a transaction. In consequence, there is now a perception of the market for the importance of building renovation sector, which is expected to be main sector of activity in the next years. The tendency for decrease in the construction market observed until 2015, changed and in 2016 the number of building permits increased by 10.9% over the previous year (-3.7% in 2015) (reference: Estatísticas da Construção e Habitação -2016, published in 2017 by INE – Statistics Portugal). This increase in construction will be reflected in the Solar Energy Market due to the mandatory use of Solar Collectors for Domestic Water Heating. In Portugal there is not a "typical" solar building, because there is not yet in the market a large offer for those buildings. But the experience gathered with the construction of the "SOLAR XXI Building" existing on the campus of LNEG in Lisbon, the final costs including 100 m2 of polycrystalline PV façade, is in the order of 800 €/m2. This is the price of 2006, it includes straight costs surveillance and excludes terrain of construction. There is no national R&D programme specific for solar thermal and/or for solar buildings in Portugal. Anyway Universities, Research Institutes and enterprises can apply for national programs, where it has been possible to accommodate part of the research and demo needs of solar technologies. Those Programs are managed by: FCT (www.fct.pt) - Science and Technology Foundation which supports graduate education and training, carrier development, research and development grants, research units, etc., in all areas of science and technology. Portugal 2020 (www.portugal2020.pt/Portal2020), which sponsors R&D in industry and services, promoted by enterprises that can apply alone, in consortium or subcontract R&D national entities. Specific private companies develop new solutions for, e.g., Solar Combistores (J. Prior); Collector for façade integration heating air and water (T&T); Medium temperature stationary concentrating collectors for Industrial applications (MCG). In the frame of projects financed by FCT (Science and Technology Foundation) study of solar thermal collector components durability are being performed by LNEG with the support of Solar Thermal Producers and in cooperation with Universities (Lisbon University – IST and New University of Lisbon – FCT). Two research infrastructures are now also financed by FCT (Science and Technology Foundation): a) NZEBLab is coordinated by LNEG and is dedicated to the research on integration of RE in buildings; b) INIESC is coordinated by University of Évora and is dedicated to research in CSP including SHIP. Portugal, as a European country is committed to contribute to the targets established in the 20-20-20 Horizon, which implies to work during the remaining years to achieve the particular goals of the country. The most important one is the 31% target for percentage of final energy consumption with RE origin. This value is actually foreseen as easily achieved because of recent large investments on the wind energy sector complemented by our great hydropower potential. In 2016 this value was 28.5% (source: Observatório da Energia – ADENE based on information from General Direction of Energy - www.observatoriodaenergia.pt/pt/energia-em-numeros/portugal/2004/2016/line/%25/2276-2303-2304, viewed in 17-04-2018). In fact, and depending on the scenario, it is foreseen to achieve that goal between 2015 and 2017. A new National Plan for the period 2021-2030 (Integrated National Plan for Energy and Climate) is being prepared and expected to have a first proposal until the end of 2018. In this plan new and increased objectives for Renewable Energies and for Heating and Cooling are foreseen. DGEG (www.dgeg.pt) - The General Directorate for Energy and Geology (DGEG) is the organ of the Portuguese Public Administration whose mission is to contribute to the design, development and evaluation of policies related to energy and geological resources, in a perspective of sustainable development and ensuring security of supply. LNEG (www.lneg.pt) - National Laboratory of Energy and Geology, is a R&D institution of the Ministry of Economy, assumed as the interface between research results and economic agent’s community. It works as a consultant for public policies in the areas of energy and geology, environment, sustainability, standardization and certification. LNEG also gives direct support to the State in the areas of international representation and provides the Government of appropriate reasoning on Science and Technology for the sectorial policies. LNEG has an accredited laboratory for testing of solar thermal systems, collectors and other components (LES) performing tests either directly to industry or to certification bodies, namely, the national certification body CERTIF, in the frame of national and Solar Keymark certification. ADENE (www.adene.pt) - National Energy Agency, ADENE is a nonprofit associative type institution, sponsored in majority (69.66%) by the Ministry of Economy (through DGEG, DGAE and LNEG) and by the concessionaires of public supply of electricity and gas (EDP and Galp Energia). ADENE performs activities of public interest in energy policy and public services concession or licensed in the energy sector, can act in areas relevant to other sectorial policies, when intertwined with energy policy, in connection with the public competent entities. ADENE is the entity responsible by all building thermal performance certification process by delegation of DGEG (Directorate General of Energy and Geology). The REH imposes the usage of solar thermal collectors for hot water production in all new buildings, if there is a good exposition to solar radiation in their cover. The same rules apply to big renovation of existing buildings. Although it is an imposition it has been accompanied along the last years, by some punctual programs sponsoring the solar thermal systems for buildings of social benefit and for companies when integrated in their overall energy efficiency measures. In the same base punctual interventions in building’s façade had benefit of similar supporting programs. The mandatory usage of solar thermal in the REH context is accompanied by the obligation of usage of certified collectors (CERTIF or SOLARKEYMARK), the obligation of certified installers and it also imposes a 6 year warranty maintenance. These set of items lead, during the last years, to the existence of several courses for designers and installers, promoted by the public and private education sectors. Some universities are also offering now in their civil and/or architectural departments lectures on the solar thermal and solar building design (IST, FEUP, FCT/UN, EEUM, UEvora, UA, etc). RD&D funding in Portugal is connected to the Programs of FCT (usually for small projects on the fundamental and applied research side coming from universities and research institutes and laboratories) and of Portugal 2020 (for projects led by companies and involving or not public research entities). Founded in 1998, APISOLAR - Solar Industry Portuguese Association, is an Association that exists for the sake of defense, development and promotion of solar photovoltaic and solar thermal, involving industrial manufacturers, importers, exporters, wholesalers, retailers components and accessories, designers, installers, etc.. For further internationalization of the domestic industry, APISOLAR joined the Federation of European Solar Thermal Industry (ESTIF) and the European Photovoltaic Industry Association (EPIA). The Portuguese Association for Renewable Energies (APREN) is a non-profit association, founded in October 1988 with the mission of coordination, representation and defence of the common interests of its Members. APREN Associates are companies holding licenses for the establishment of centrals for renewable electricity production, as well as any natural persons or legal persons interested in the development of renewable energies in Portugal. APREN represents about 90% of the electrical installed capacity produced by renewable sources. APREN participates in the development of energy policies for Portugal, promoting the use and exploitation of renewable resources for domestic electricity production. APISOLAR (www.apisolar.pt) - Solar Industry Portuguese Association. ADENE (www.adene.pt) - National Energy Agency, keeps actualized all important information (laws, codes, software, certificates, statistics, courses, etc.) related with building thermal certification in Portugal.